Besides having maybe one of the coolest civilian names of any superhero ever, Janet Van Dyne is one of the founding Avengers. As well as being the character who named the team way back in 1963, she’s also a rich kid from New Jersey from a well-to-do family, eventually helping to fund the Avengers at times. As with many superheroes before her, she was spurred into action when she experienced a personal tragedy. In this case, that was the death of her father, also a scientist, killed by an alien entity during one of his experiments. When Janet first appeared in Tales to Astonish as the self-declared sidekick of Ant-Man, both of them had shrinking powers, gained from technology that Hank created. Later, in the Avengers, there was some pretty uncomfortable gender stuff: Hank Pym took on the more powerful, overly masculine Goliath role while Janet stayed the Wasp, and therefore had nearly every male teammate refer to her as “little gal” or “little lady” on the regular. Many of their villains, but often her fellow Avengers as well, attributed Janet’s desire to be a hero to her need to impress Hank—or, as more realistic/cynical fans have observed, to keep tabs on him. I would agree that Janet’s need to subtly control Hank’s often fractured emotional state definitely played a role in their relationship, but we can’t forget that she got into the superhero game to avenge her father, and she really put the work in to be an Avenger. Besides, for a Stan Lee written female character, she usually fared better than characters like Sue Storm and Jean Grey, who were more or less regulated to the role of supportive side character in their own team books. Even before she had offensive powers, she was an Avenger, and did her part to save her teammates many times. In short, Jan showed at least the same amount of interest in the team and had the same amount of energy for it that Hank did. As time went on, Hank’s heroics began to seem more for Jan’s attention than the other way around. The marriage between Hank Pym and Janet Van Dyne occurred in Avengers #60, and it is totally, unbelievably freaking weird. The whole thing begins with everyone believing Hank has been unceremoniously dumped and replaced in the affections of one Miss Van Dyne when she announces her engagement to the previously unheard of Yellowjacket. There’s a lot about the story that I find to be questionable, but, what I enjoy about it is it’s perhaps the first time we meet with Jan’s temper. Everyone that even remotely questions her decision is met with her insistence that she’s in control of her own life. Ultimately, we discover that an increasingly fractured Hank Pym is indeed Yellowjacket, that Yellowjacket is his new, no-holds-barred, kind-of-a-jerk persona. His explanation for the change is that he felt he was spiraling out of control and couldn’t give Jan what she needed, which is a nice sentiment, but by today’s standards we can see a lot of reasons why this marriage should never have happened. This article isn’t about Hank, but their relationship played a huge part in Jan’s characterization for many years. By believing that Jan’s love could “fix” him, both she and he did a disservice to Hank’s ongoing mental health issues, causing them more harm than good. It was while he was with Janet that some of his most severe mistakes were made, professionally and personally. For instance, Hank’s love for making murder robots with human consciousnesses took him through Ultron and the Vision, causing his teammates untold grief. Eventually, Ultron the murder robot decided he needed his own murder robot, and based her psyche on the consciousnesses of Janet Van Dyne. In one very strange scene, they’re both tied naked to tables with cables connecting them. The origin of the name Jocasta in fiction comes from the mother and later girlfriend of Oedipus in Greek mythology, just to give you a head’s up on exactly how weird this all is. Jocasta turns out to be a little too much like Janet for Ultron’s liking. Neither Janet nor Jocasta will stick around to put up with abuse, so Jocasta, like the Vision, betrays Ultron, and becomes an ally to the Avengers. Hank and Janet’s relationship was always a little messed up, and, in the early days, required her to chase after Hank as he ignored and condescended to her, but alternately would pout and express jealousy when she crushed out on other men. When they did marry, it was with the complete knowledge that Hank was suffering from mental illness. Often referred to as schizophrenia in the comic—I’m not a psychoanalyst and will leave the armchair diagnosis to the writers—but it was increasingly obvious even from the beginning that Hank wasn’t always in a place where he was capable of having a healthy relationship with someone. For her part, although she did so with good intentions, Janet exploited his confusion and fed into his dependency on her. On the other hand, Hank allowed himself to view Janet as being intellectually inferior to him, a belief which came under serious suspicion as the years went by and we saw Janet become a scientist herself, not to mention taking over and leading Avengers teams with a confidence and authority that Hank himself could never have possessed. Even years later in the Beyond! mini-series, we see Janet and Hank begin to rekindle their romance, only to have Janet reveal, “I can’t see past what he did to me.” For his part, Hank makes vows to be “worthy” of Janet, then almost immediately hooks up with another woman that appeases his need to appear strong and capable. It’s a relationship that has tried and failed many times, and it becomes more and more painful to read as time goes on. In the early days, Jan completely lacked in offensive capabilities, and her primary role for the team was subterfuge. Later, Hank invented for her the Wasp’s Sting, a bio-kinetic blast emanating from her wrists. Jan has since had her fair share of brawls, including a time when she beat a woman absolutely silly for dressing in the original Yellowjacket costume and told her not to wear it ever again. This is one of my favorite issues focusing on Jan, because she’s stressed out, just went through a divorce with the original Yellowjacket for striking her during an argument, and leading the Avengers, and her whole reaction is more or less just, “can you believe the audacity of some people?” Then, she gets over it. Like, immediately. Janet Van Dyne’s ability to cope with tragedy and loss and to come through on the other side looking even better than she did before has got to be a secret mutant power. Janet of the 1980s is the best Janet, because you see her really start to break away from her relationship with Hank and define herself more in context of her team. When she kicks Hank out of their house, she returns to the Avengers and nominates herself as chairperson, while Hank literally wanders the city with a five o’clock shadow bemoaning how unworthy he is of her. And … goes to jail. While Hank is in jail, Janet briefly dates Tony Stark, who lies to her about having “come out” as Iron Man while she was busy going through a divorce and leading the Avengers. Dismayed by his dishonesty and unwilling to hurt Hank any further, Janet calls the whole thing off, making her one of the few female characters in Marvel to show Tony Stark the door rather than the other way around. This era of her as the leader of the team lasted from Avengers Volume One #217–278, then she later resumed leadership in Avengers Volume Three. Janet has to date led the team longer than any Avenger besides Captain America. As the team’s chairperson, Janet is at her best. She walks in one day, nominates herself, and then forces everyone to vote on the spot. Once she gains leadership, she immediately pushes for more female members. Janet is a feminist! Into the 1990s and 2000s, we see less of her. She briefly joins the West Coast Avengers and reconciles once more with Hank. Then, she turns into a human wasp hybrid for a little while, which made no sense whatsoever, but was still kind of pandemonium. In Secret Invasion, Jan died, then came back, staying gone for about as long as it takes to go out for groceries. 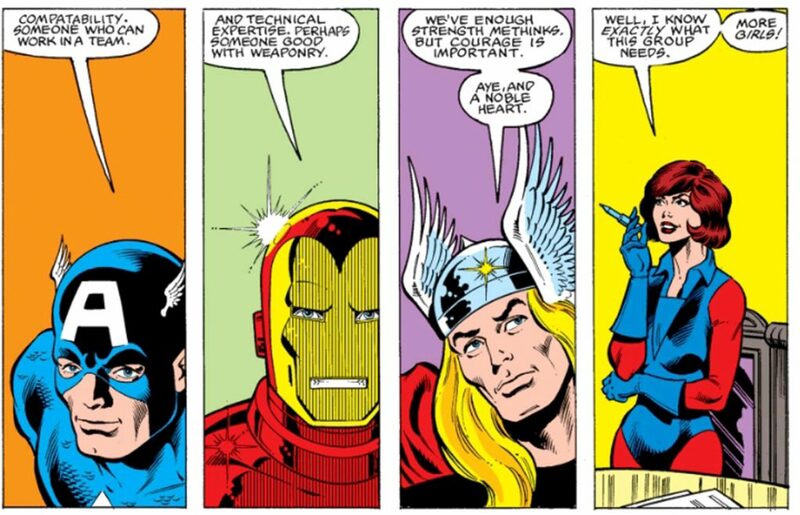 Jan has always had a lot of great friendships in the Avengers, from her low-key scandal-loving gossip with the Scarlet Witch to her partnership with Captain America. She’s one of the few characters in comics who has no trouble at all walking up to anyone from Wolverine to Uatu the Watcher with a friendly smile and a “how do you do?” Still, of all her many friendships, my favorite is the one she has with Jarvis the Butler. Even though there isn’t nearly enough time devoted to this, one of the most perfect friendships in all of fiction history, when you see Janet interact with Jarvis, you really see how genuinely likable they both are. When all the other Avengers are livid with Janet for deciding to marry Yellowjacket, Jarvis is just so stoked to help out, and walks around assuring everyone that he’s taking care of everything with a big smile on his face. Many, many issues later, when he is injured and lands in the hospital, she is shown to visit him, asking him to save a dance for her for when he’s feeling better. It took me a long time to see an upside to Jarvis, who is very seldom characterized beyond his job title. I finally started to like him when I realized that he and I have something in common: The Wasp is our favorite Avenger. Most recently, Janet appeared in Rick Remender’s run on Uncanny Avengers, and I will say this, I don’t always love that series, but his characterization of Janet is pretty spot on. Her taste in men is still terrible, as indicated by her attraction to Havok, but her forwardness, her confidence, her cutting business instincts, and her genuine love of life are as prevalent as ever. In a very strange and mostly unexplained turn of events, taken to the future by Kang, she and Alex have a daughter, who is then either vaporized or kidnapped by Kang, never to be seen again, until later. It takes Janet a long time to grieve over her lost child, longer than any other trauma of the many in her life. Still, she shows up later in The Unstoppable Wasp, offering advice and patience, showing herself to be a true friend to Nadia Pym. Between Nadia’s being her ex-husband’s child and having taken up her mantle without asking, Janet didn’t have any reason to reach out to Nadia, but, because she is who she is, she shows up in the Unstoppable Wasp series, dedicating time and energy into helping “the kid” get settled. Janet Van Dyne is a fantastic character, often misunderstood by fans and creators alike, but still just rad all around. With her, what you see is what you get. Even the most questionable writers have usually been careful to counterbalance her flaws with strengths. Her vanity always comes with a degree of humility. Her levity has often been one of the only fun parts of what can be at times an overly serious book. Even her flaws, such as her need to control her partners, come from a place of deep, often unexplored insecurity, and she improves over time. I like her a lot, and even in the very worst issues of the Avengers, her personality has always stood out to me as a reason to keep reading.